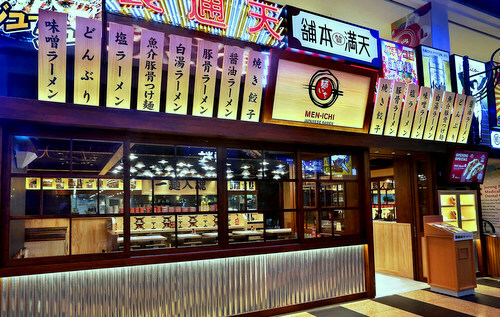 Men-Ichi Japanese Ramen restaurant has five locations in Singapore, one of which is within Jurong Point mall (1 Jurong West Central 2). The restaurant has a menu featuring rich ramen soups that derive their essence from high-pressure cooking that extracts maximum amount of umami & sweetness from the ingredients such as pork bone, pork backbone, chicken bone & vegetables. Men-Ichi’s specialty tonkotsu (pork-based) soup is creamy & rich in collagen. In fact, each bowl of Men-ichi tonkotsu ramen contains 9500 mg of collagen. The recipes feature 100% home-made noodles of different thickness that best complement the different soup bases. Men-Ichi’s thin noodles have an aroma of wheat with an springy texture and are best paired with lighter Shoyu or Shio broths. The thicker Nishyama noodles, meanwhile, are hand-picked from Hokkaido for their smooth texture that goes perfectly well with the thicker Miso broth. Made from quality butabara (pork belly), Men-Ichi’s char siew is first oven-roasted, then boiled with the restaurant’s home-made sauce till the flavour is fully immersed in the meat. Men-Ichi Japanese Ramen belongs to a portfolio of restaurant brands owned by RE&S. Other brands owned by the group include Kuriya Dining, Ichiban Boshi, Ichiban Sushi, Kuishin Bo, Shimbashi Soba, Yaki Yaki Bo, Sumiya, Kabe No Ana, Ami Ami, Shabu Tontei, Gokoku, Shabu-Ichi, Tokyo Eater, Fiesta, Shokutsu Ten, Wadori, Kuriya Japanese Market, Ichiban Bento, Idaten Udon, Ginzushi, Daimon Food Alley, and Tenfuku Tendon Specialty.